Granny Smith Green Apples: Why Use Them For Juicing? There is no right or wrong about what type of apples to use for juicing, simply about “what’s better”. I mainly use Granny Smith green apples for juicing. When they are not available, I use any other variety of green apples that are available. Antioxidants: They are particularly high in antioxidants that neutralize free radicals in the body, preventing chronic diseases. Phytonutrients: They have high content of certain metabolite phytonutrients that make them a good “weight loss” food choice. Fiber: Granny Smith apples leave less residue when juiced. Enzymes: They have different enzymes that are a natural and gentle laxative, making them a good colon-cleanser for better colon health. Lower calories: They are less sweet and lower in calories compared to the other varieties; at about 80 calories in a 3-inch diameter fruit. Tastes good: They have a tart taste that mixes really well with green juices. Less sugar: They have less sugar and are a good blood sugar regulator fruit, making it suitable for consumption by individuals who are diabetic or pre-diabetic. Higher potassium content: They have a slightly higher potassium content compared to the other varieties, a compound that is responsible for nerve cell functions and a heart-health promoter. 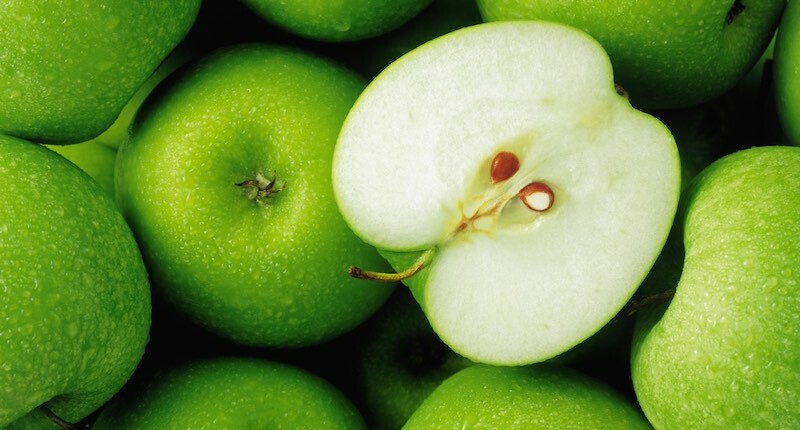 Granny Smiths is a great addition to any weight loss plan, thanks to their high fiber content. They are very low in calories (just about 80 for a medium apple) and easily fill you up. Apple contains soluble fiber, which attracts water to the intestine, slowing digestion, reducing sugar spike, and forcing food to stay in your stomach. This process causes you to feel fuller for longer, thus helping you to keep eating more. Most importantly, when you eat a Granny Smith green apple, the indigestible fiber reach your colon, ferment and become food (prebiotics) to feed the beneficial bacteria, thus improving your overall wellbeing and immune system. Read more about the many health benefits of apples.